Due to recent changes in legislation, when a driver is granted accreditation, it’s ongoing and doesn’t have an expiry date. Driver accreditation will only expire if it’s cancelled by us or surrendered by the driver. This means the old Application to renew your driver accreditation form (renewal) will no longer be issued. Instead, you will need to pay an annual fee, and complete (and pass) a medical assessment every three years, to ensure your driver accreditation remains current. If you hold a conditional accreditation (you were previously required to complete a renewal every year) you will need to continue to pass an annual medical assessment. a request for relevant specialist report/s, if required. If you require specific information see a list of answers to frequently asked questions. 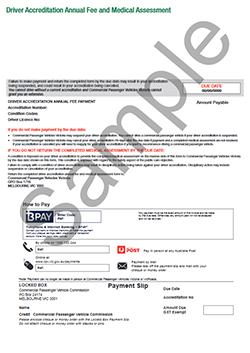 CPVV will start issuing annual driver accreditation fee invoices again from 1 May. A lot has changed for the commercial passenger vehicle industry over the last 18 months and we had to make sure we had the right systems and processes to deliver those changes. We put all driver accreditation invoicing on hold in October 2018 so that we could improve the driver accreditation annual fee process. Now that this has occurred, we have resumed issuing annual invoices. If you were due to receive your invoice between October 2018 and May 2019, it will be posted to you during the first week of May. You will also receive your medical assessment form to complete. If you have already provided us with a medical assessment and specialist reports in the last three months, then you do not need to submit them again. The annual fee of $33.20 will be payable by the due date given on the individual invoice. Drivers whose accreditation was due to expire between 8 September 2018 and 30 June 2019 will receive a driver accreditation Annual Fee and Medical Assessment form. This form replaces the ‘renewal’ application form. A sample of it can be found below. Attend a medical appointment and have the registered medical practitioner complete the medical assessment part of the form. Your doctor may ask you to complete a driver health questionnaire form PDF, 70.3 KB to help them make their assessment. Return the completed medical form via mail to Commercial Passenger Vehicles Victoria, GPO Box 1716, Melbourne VIC 3001. The medical assessment must be carried out following the national medical standards described in the current assessing fitness to drive guidelines on the Austroads website. These guidelines detail the examination process and the medical criteria for assessing a person’s fitness to drive. Driver accreditation applicants must meet the commercial vehicle driver standards. You are responsible for any costs incurred completing these medical assessments. You must complete and return the medical assessment to us by the due date to avoid your accreditation being suspended or cancelled. Driver accreditation medical assessments may take up to 10 business days to process. It’s highly recommended that you submit your applications early to avoid delays. You must pay your annual driver accreditation fee by the due date on the invoice to avoid your accreditation being suspended or cancelled. If, after 28 days, payment has still not been received, your driver accreditation may be cancelled. If your driver accreditation is cancelled, you will need to make a new application. If you held current/valid driver accreditation prior to 2 July 2018, your accreditation will automatically change to ongoing accreditation. You don’t need to reapply. You will be sent an annual fee invoice when you are next required to make a payment. You will still be required to complete either yearly or three yearly medical assessments, along with any medical specialist reports that are requested by us. All required documents must be sent to us prior to the invoice due date for your accreditation to be maintained. If you require further information see a list of answers to frequently asked questions.